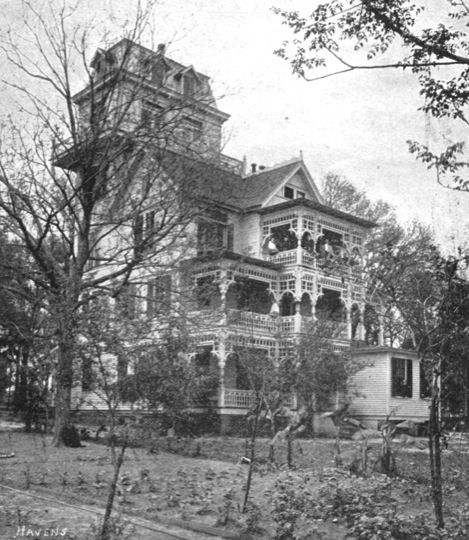 The home’s fifth-story observation tower, seen at the rear of the home, was a popular place to view the St. Johns River harbor. This December, as the Jacksonville Historical Society celebrates its 13th annual Gingerbread Extravaganza, we’re reminded of one of the most elaborately decorated homes ever built in Jacksonville—one whose extravagant, exuberant ornamentation surely is deserving of the term “Gingerbread” architecture. When this house was first built in 1872 on (what would become) Riverside Avenue, much of the surrounding land remained wilderness and cowboys still drove cattle down the main dirt road. It was a two-story wood home, featuring a balustrade porch upstairs and a long passageway to the kitchen and servants quarters downstairs that made it typical of country homes built by ships’ carpenters in the latter part of the 19th century. 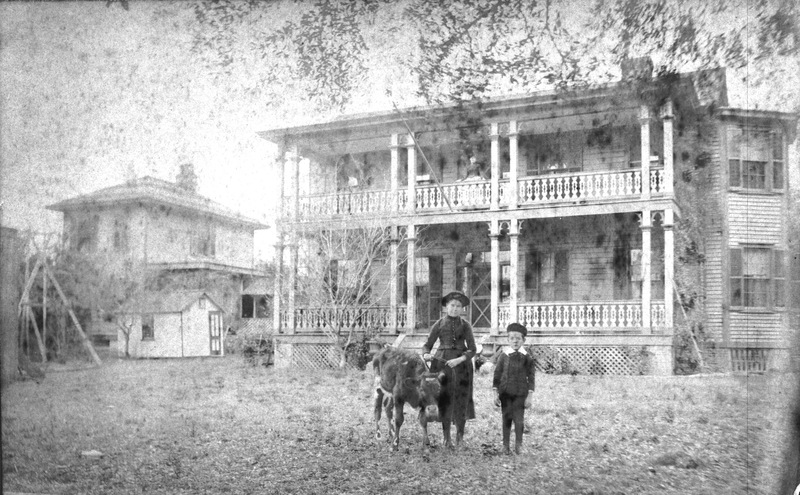 The Greeley home before its extraordinary renovation. That’s young Meelen Greeley on the right. However, by 1893, it had been extensively remodeled. A self-styled architect with a lively imagination transformed the building into a fancifully decorated multi-storied house capped with a fifth-story observation tower that looked out on the St. Johns River. 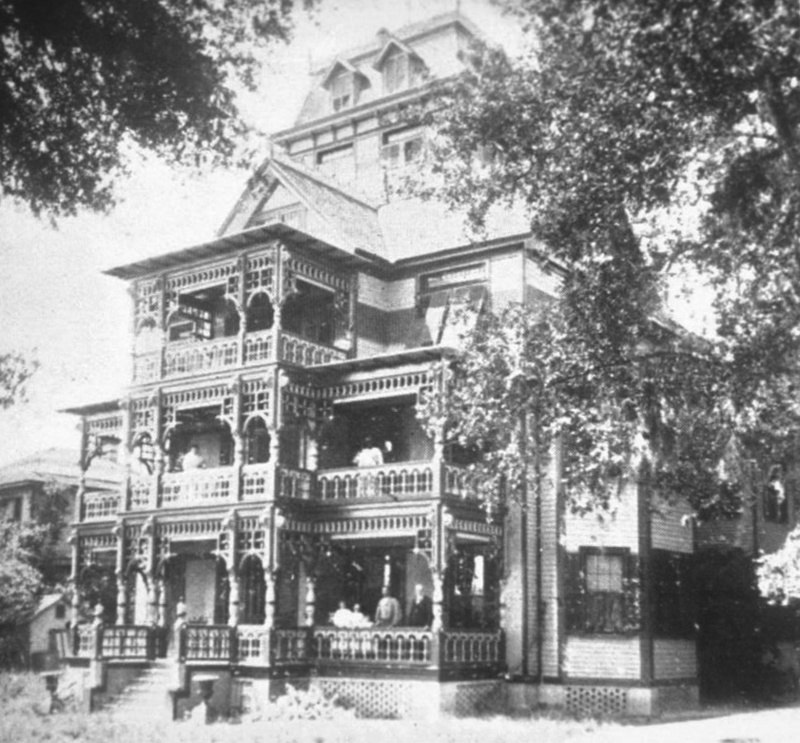 Although a private home, it would become one of the principal attractions for tourists flocking to the city then known as “The Winter City in Summerland.“ Weekend after weekend, they came in small groups to the tower for an aerial view of the Jacksonville harbor, especially—after 1888—of the newly built railroad bridge that Henry Flagler had constructed. 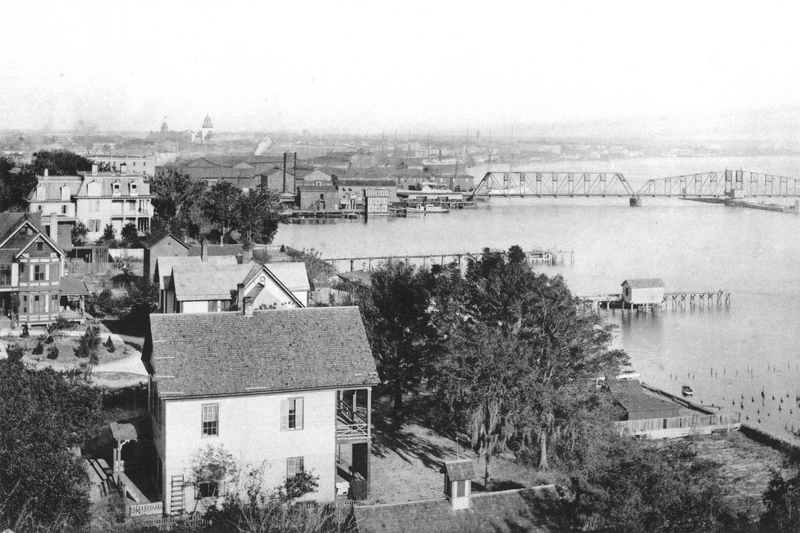 Jacksonville Harbor in 1892, as seen from the Greeley house in Riverside. The new railroad bridge would be rebuilt in 1923, replacing the butterfuly draw with a double-track bascule lift. J.C Greeley (Mayor of Jacksonville from 1873-1874 and member of the State Senate from 1883-1886) owned the house, which he christened Benvenuto. It was also the childhood home of Mellen Greeley who, by the time of his death in 1981 at the age of 101, was widely acknowledged as the “Dean of Jacksonville architects.” (One wonders if the fantastical alterations to his childhood home inspired his profession? He later observed, “What a scroll saw and turning lathe did to the building [was] almost beyond belief”) Fortunately, many of the homes Greeley designed during his auspicious architectural career still stand in the Riverside area today. Alas, Benvenuto only survived until 1916, when it was torn down to make way for the Chrysler and Royal Motors dealerships. Today, the YMCA building occupies the site that once hosted what is probably the most outrageously ornate building ever built in Duval County.